Alnitak, Alnilam, and Mintaka, are the bright bluish stars from east to west (left to right) along the diagonal in this gorgeous cosmic vista. Otherwise known as the Belt of Orion, these three blue supergiant stars are hotter and much more massive than the Sun. The big, beautiful Andromeda Galaxy, aka M31, is a spiral galaxy a mere 2.5 million light-years away. Two space-based observatories have combined to produce this intriguing composite image of Andromeda, at wavelengths outside the visible spectrum. The remarkable view follows the locations of this galaxy's once and future stars. Late last year, a new, remarkably bright storm erupted in Saturn's northern hemisphere. Amateur astronomers first spotted it in early December, with the ringed gas giant rising in planet Earth's predawn sky. How does your galaxy grow? Quite contrary to a typical galaxy, this one needs water to flourish. Pictured above as it appears at the Paleaku Peace Gardens Sanctuary in Kona, Hawaii, USA, a meticulously planned garden spanning about 30 meters provides a relatively accurate map of our Milky Way Galaxy. Has a new planet been discovered? What is pictured above is a remarkable 24 hour mosaic surrounding a spot on Sounio, Greece, right here on planet Earth. Images taken at night compose the top half of the picture, with star trails lasting as long as 11 hours visible. Globular star cluster 47 Tucanae is a jewel of the southern sky. Also known as NGC 104, it roams the halo of our Milky Way Galaxy along with some 200 other globular star clusters. Would you go to the end of the world to see a total eclipse of the Sun? If you did, would you be surprised to find someone else there already? In 2003, the Sun, the Moon, Antarctica, and two photographers all lined up in Antarctica during an unusual total solar eclipse. The Quadrantid Meteor Shower is an annual event for planet Earth's northern hemisphere skygazers. It usually peaks briefly in the cold, early morning hours of January 4. The shower is named for its radiant point on the sky within the old, astronomically obsolete constellation Quadrans Muralis. Gorgeous spiral galaxy NGC 3521 is a mere 35 million light-years distant, toward the constellation Leo. Spanning some 50,000 light-years, its central region is shown in this dramatic image, constructed from data drawn from the Hubble Legacy Archive. 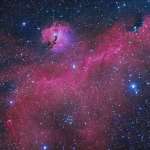 This broad expanse of glowing gas and dust presents a bird-like visage to astronomers from planet Earth, suggesting its popular moniker - The Seagull Nebula. This portrait of the cosmic bird covers a 1.6 degree wide swath across the plane of the Milky Way, near the direction of Sirius, alpha star of the constellation Canis Major.